That Darth Vader line has always creeped me out a little. This stuff, though, featuring a pair of storyboard artists working in the games industry, does nothing of the sort. After I ran that Crysis 2 art last week, I was contacted by Trudi Castle, another artist who worked on the game. 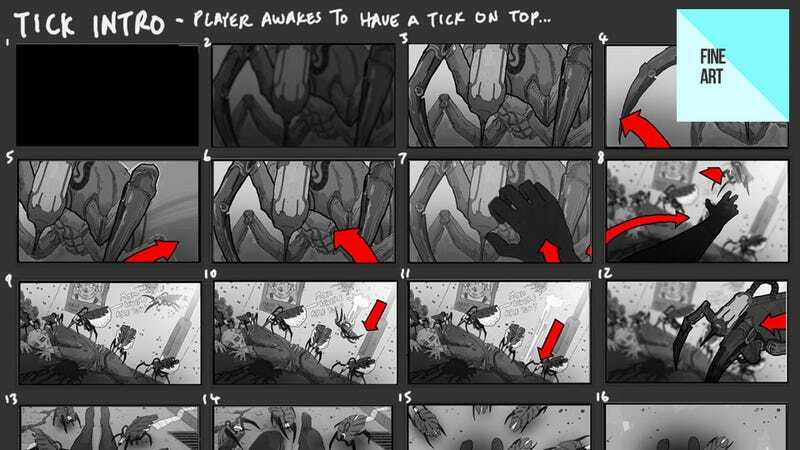 Unlike the static pieces we generally feature here on Fine Art, though, Trudi had provided some storyboards for the game, to illustrate its more cinematic moments. Providing the others? Trudi's twin sister Astrid. It's cool the pair aren't just working in the same industry but on the same projects (though Trudi has since worked on Halo Anniversary), but even cooler is they've given us the chance to show off some of the other kinds of art that go into making a video game. Sure, "traditional" 2D concept art looks pretty and is the building block of most games, but it's not the only creative work that goes into the building of a virtual world; people like animators and, here, storyboard artists do their part too. After all, cinematic sequences (even in-engine ones, like these) don't just happen. Somebody has to plan them out!